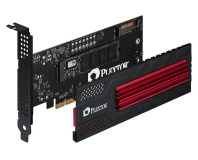 Storage giant Plextor has announced a PCI Express solid-state drive (SSD) explicitly designed to target gamers and offering an impressive 770MB/s read speed. 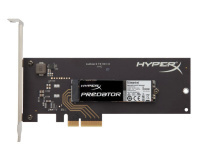 Connecting a wodge of solid-state storage as an add-in card rather than a SATA-connected drive isn't a new concept: while the first such products were targeted at the datacentre and professional workstation market, PCIe SSDs have been slowly dropping in price to the point where they can now be considered a real option for gamers looking to trim load times to an absolute minimum - and it's here that Plextor enters with the M6e. The M6e offers full AHCI support for driver-free use on all operating systems with full support for use as a boot drive, a distinct change from the days of PCIe SSDs requiring Windows-only drivers to operate. Using a Marvell 88SS9183 controller and Toshiba toggle NAND flash, Plextor claims the drive hits peak sequential read and write speeds of 770MB/s and 625MB/s respectively - not the fastest on the market, but certainly respectable - and offers random read and write performance of 105,000 and 100,000 input-output operations per second (IOPS) respectively. 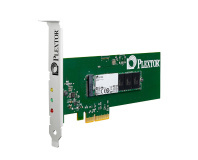 While Plextor has bought the controller in from Marvell, the company claims to have developed the firmware in-house to optimise gaming performance. The company has promised to launch 128GB, 256GB and 512GB models, but has yet to provide pricing or availability.